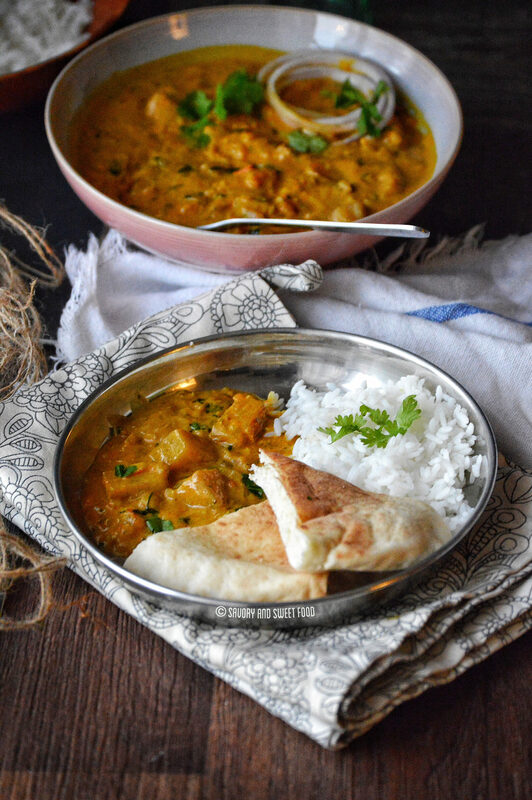 A very thick and rich potato curry with a gravy made with coconut milk and cashew nuts. 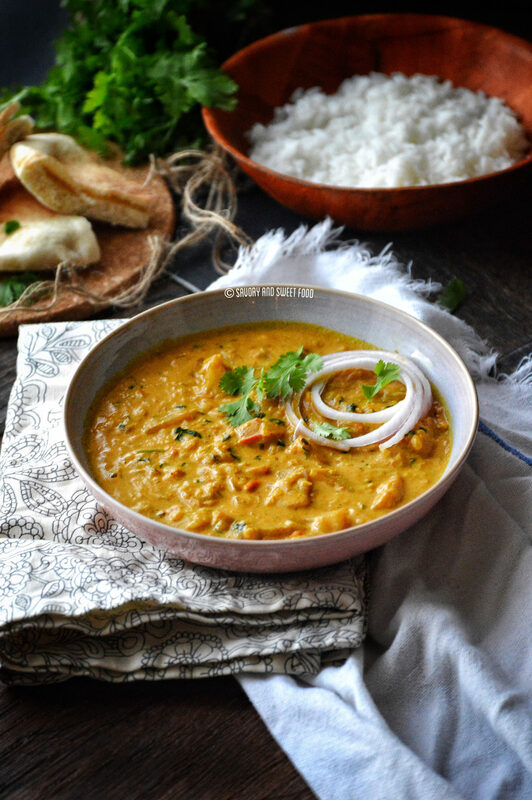 It is spiced very well with the indian spices, and a final touch of kasuri methi and butter gives the curry a whole new taste. Nowadays I am always in search for good vegetarian recipes, just for you guys. 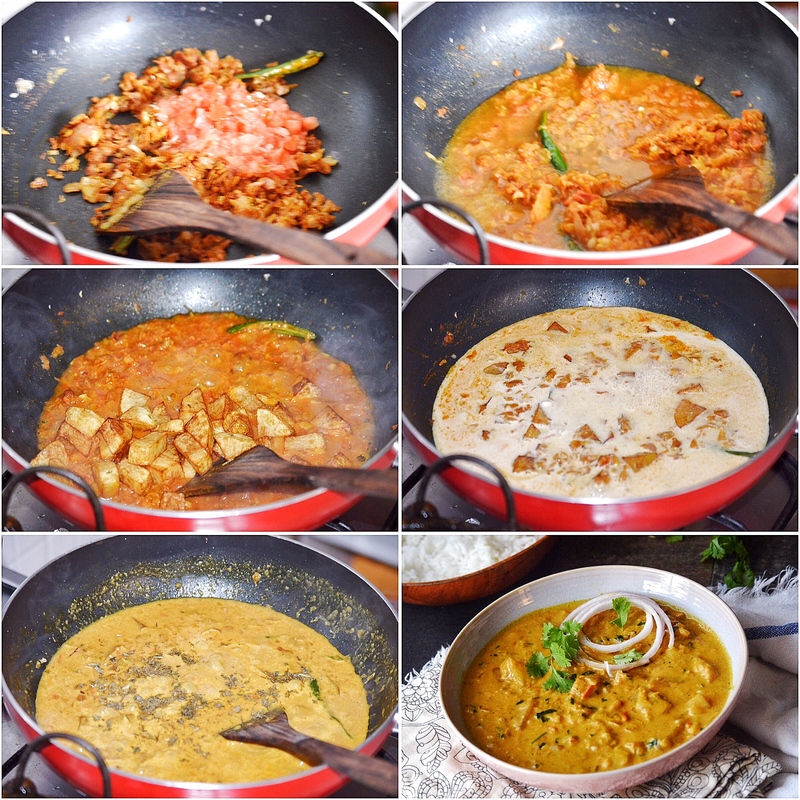 After seeing soo many requests for vegetarian dishes in the survey, I started thinking to myself, why don’t I cook much veggie dishes at home. Okay, that’s because my hubby is a strict non-vegetarian. He has to have either chicken, fish or mutton every day, seriously. 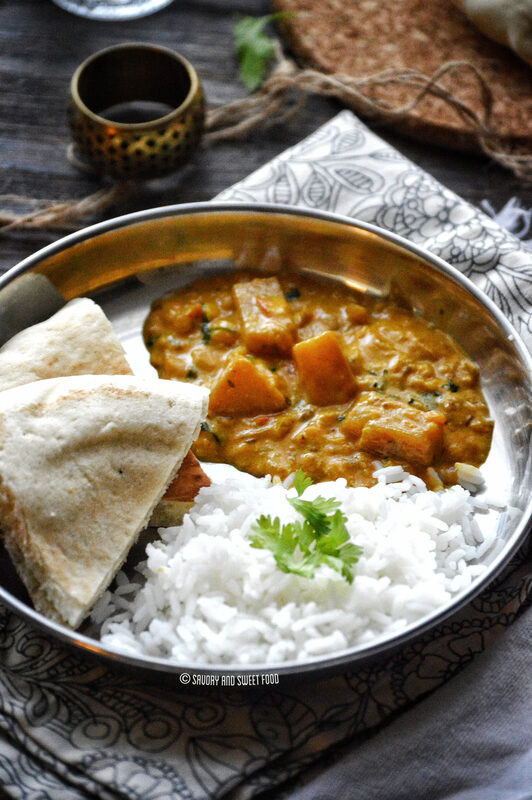 But nowadays he started liking some of the veg curries I make, like this potato curry. 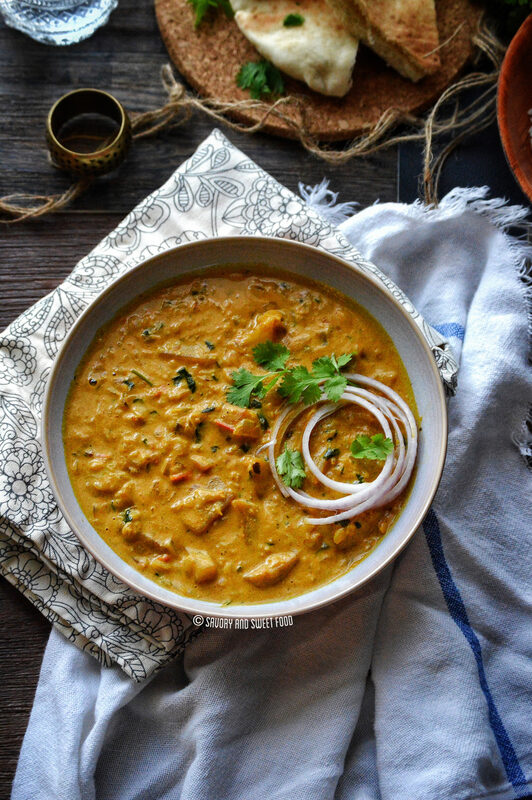 This curry is so rich, and so flavorful with a nice thick gravy which I think nobody can dislike. The best kind of recipes are the ones you tend to make over and over again, without realizing that it is one of your favorite recipes. The one that are made up of simple ingredients which are always there in your shelf, which doesn’t have elaborate steps and of course produce incredible results. That my friends, is this amazing potato curry. I’ve kept this beautiful dish hidden for a while now but now it’s time to bring it’s beauty to light. This is my besty Nimeena’s (who contributed a loot to this blog…thank you love <3) mom’s recipe, who by the way is a fantastic cook. Me and my other besty Sonia used to always go to Nimeena’s house just to have Sayda aunty’s delicious food. Actually I had copied this recipe from Nimeena long long time back, so long back that even she doesn’t remember such a curry existed, hahaha! So here is the recipe for all of you and especially for you nimnaa. 😀 Enjoy! If you do not want to deep fry the potatoes, you can shallow fry it. The curry thickens as it sits. 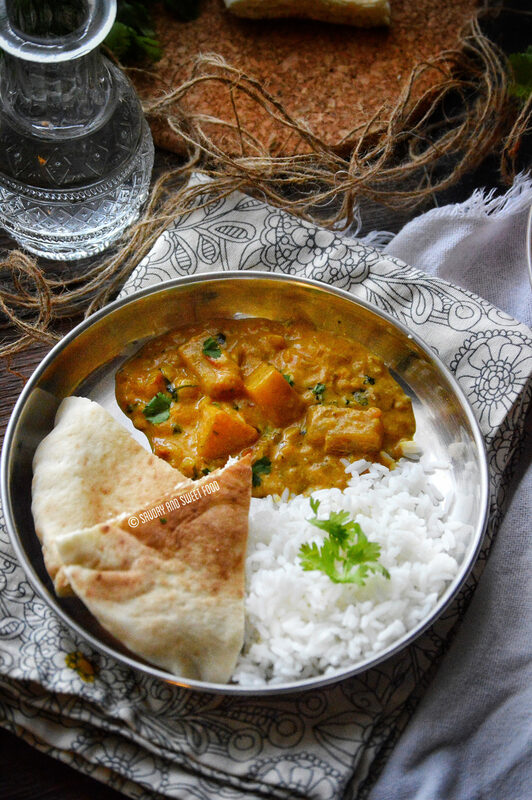 If you are not serving immediately, heat the curry by pouring in a little water later before serving. You can add other vegetables like cauliflower, green peas too. 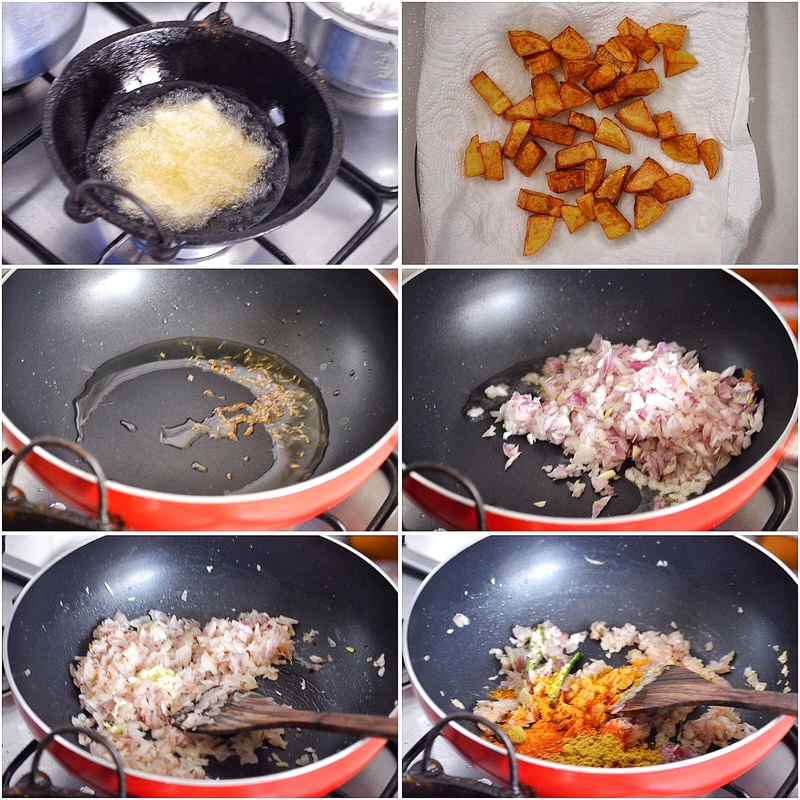 Deep fry the potato cubes and drain it a tissue towel. In a pan add oil. Add zeera and let it splutter. Add onions and saute till browned and soft. Add in the ginger and garlic pastes. Sauce for a minute. Add in chili powder, turmeric powder, coriander powder, and garam masala powder. Stir around for a minute. Add the tomato. Cook it till it is soft and mashed up. Pour 1/2 cup of water. Add the fried potato and cook covered for 5 minutes. Pour this into the curry. Let it come to a boil. Cook for 2-3 minutes till gravy becomes thick. Add in Kasuri methi. Mix. Add chopped coriander leaves. Finally add in a cube of butter. Add the tomato. Cook it till it is soft and mashed. That sauce sounds fabulous! And great with other vegetables too i should think? Thank you Elaine. Yess it would go great with other vegetables too. Followed your recipe thoroughly.. It tasted good.. But the curry didnt get a thick consistency. Infact, i tried simmering it for some more time.. But it has the same water like texture. What went wrong? Also which coconut milk powder do you use? Hey! That’s sad. It has to get thick with the cashew paste and all. No idea why it didn’t. I use Maggi coconut milk powder.